For the English footballer, see Charles Clerke (footballer). For the Archdeacon of Oxford, see Charles Clerke (priest). Captain Charles Clerke (22 August 1741 – 22 August 1779) was an officer in the Royal Navy who sailed on four voyages of exploration, 3 with Captain James Cook. When Cook was killed during his 3rd expedition to the Pacific, Clerke took command but died later in the voyage from tuberculosis. Clerke started studying at the Royal Naval Academy in Portsmouth when he was 13. During the Seven Years' War he served aboard HMS Dorsetshire and HMS Bellona. He was in the mizzen-top of HMS Bellona when the mast was shot away in 1761 and he became the only survivor of those who consequently fell overboard. In June 1764 he joined Captain John Byron, aboard HMS Dolphin, on Byron's expedition to explore the Pacific. The Dolphin returned in May 1766. Its circumnavigation of 22 months was the shortest up to that point. Upon his return Clerke published an account of encountering Patagonian giants, a hoax which the Dictionary of Canadian Biography attributed to his high spirits. Clerke's last three voyages were all under the command of Captain James Cook. 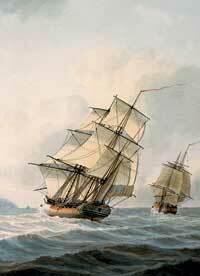 He started the first voyage aboard HM Bark Endeavour (1768–1771) as a master's mate. Cook promoted him to acting lieutenant in 1771, and he was officially confirmed in that rank on 31 July 1771. 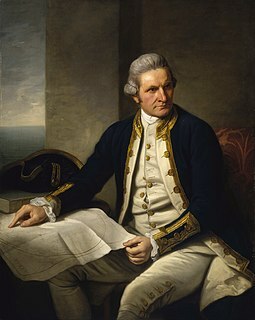 He was HMS Resolution's second lieutenant on Cook's second voyage (1772–1775). The grave of Charles Clerke (on the right) in the centre of the city of Petropavlovsk-Kamchatsky in Russia. For Cook's third expedition, Clerke was placed in command of HMS Discovery, receiving this command on 26 August 1775. When Cook was killed in a skirmish with Hawaiians on 14 February 1779, Clerke took command of the expedition and of HMS Resolution. He continued the expedition's exploration of the Northern Pacific coast, searching for a navigable Northwest Passage. The expedition then proceeded to the Pacific coast of Siberia. Lieutenant James King, one of his subordinates, wrote that Clerke's illness had reduced him to skeletal thinness. On 10 August 1779, Clerke wrote in a letter to Sir Joseph Banks that, "The disorder I was attacked with in the King's bench prison has proved consumptive, with which I have battled with various [unclear] although without one single days health since I took leave of you ... it has now so far got the better of me that I am not able to turn myself in bed, so that my stay in this world must be of very short duration." Clerke died from tuberculosis on his 38th birthday (22 August 1779) en route to Kamchatka from the Bering Strait. He was buried in Kamchatka on 29 August 1779. Clerke's second in command, Lieutenant John Gore took command of the expedition as captain of Resolution, appointing King as captain of Discovery. 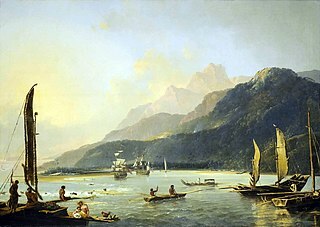 The expedition then sailed via China and the Sunda Strait to Cape Town, returning to England in August 1780. In 1913, the British Admiralty erected a small obelisk in Clerke's honour at Petropavlovsk-Kamchatskiy, Russia, with an inscription in English. ^ The Captain Cook Encyclopædia, p. 61. John Robson. Random House Australia. ISBN 0-7593-1011-4. ^ The Captain Cook Encyclopædia, p. 62. John Robson. Random House Australia. ISBN 0-7593-1011-4. ^ Charles Clerke (1779). Letter to Joseph Banks 10 August 1779. State Library of New South Wales, Sydney. ^ Rigby, Nigel; Pieter van der Merwe (2002). Captain Cook in the Pacific. National Maritime Museum, UK. p. 61. ISBN 0948065435. Charles Clerke (1772). Letter to Joseph Banks 13 May 1772. State Library of New South Wales, Sydney. Charles Clerke (1776). 01 Letter to Joseph Banks July 1776. State Library of New South Wales, Sydney. Charles Clerke (1776). 02 Letter to Joseph Banks July 1776. State Library of New South Wales, Sydney. Charles Clerke (1775). Letter to Joseph Banks 31 July 1775. State Library of New South Wales, Sydney. Charles Clerke (1779). Letter to Joseph Banks 10 August 1779. State Library of New South Wales, Sydney. HMS Discovery was the consort ship of James Cook's third expedition to the Pacific Ocean in 1776–1780. Like Cook's other ships, Discovery was a Whitby-built collier originally named Diligence when she was built in 1774. Purchased in 1775, the vessel was measured at 299 tons burthen. Originally a brig, Cook had her changed to a full rigged ship. She was commanded by Charles Clerke, who had previously served on Cook's first two expeditions, and had a complement of 70. When Cook was killed in a skirmish with natives of Hawaii, Clerke transferred to the expedition's flagship HMS Resolution and John Gore assumed command of Discovery. She returned to Britain under the command of Lieutenant James King, arriving back on 4 October 1780. David Samwell was a Welsh naval surgeon and poet. He was an important supporter of Welsh cultural organisations and was known by the pseudonym Dafydd Ddu Feddyg. The Age of Discovery, also known as the Age of Exploration, was a period in history starting in the early 15th century and continuing into the early 17th century during which Europeans engaged in intensive exploration of the world, establishing direct contacts with Africa, the Americas, Asia and Oceania and mapping the planet. Scientific matters at this time were of little interest as exploration was mostly commercially and politically motivated. Captivated by the lure of gold, silver and spices, Portuguese and Spanish sailors pioneered new trade routes to the Indies.